Lord Krishna enjoys by manifesting Himself as the Spiritual Masters, the devotees, the diverse energies, the incarnations and the plenary portions in the form of the Panca-Tattva. The Panca-Tattva are all six in one. I therefore worship the lotus feet of these six diversities of the one truth, the Panca-Tattva, by invoking their benedictions. I offer my respectful obeisances unto the spiritual masters, the devotees of the Lord, the Lord’s incarnations, His plenary portions, His energies and the primeval Lord Himself, Sri Krsna Caitanya Mahaprabhu. Lord Caitanya Mahaprabhu is the source of energy for all His devotees. He is maha-vadanyavatara, the most magnanimous incarnation of the Lord, for He does not consider the offenses of the fallen souls. In order to take full benefit of the Hare Krishna Mahamantra, we must first take shelter of Sri Caitanya Mahaprabhu. 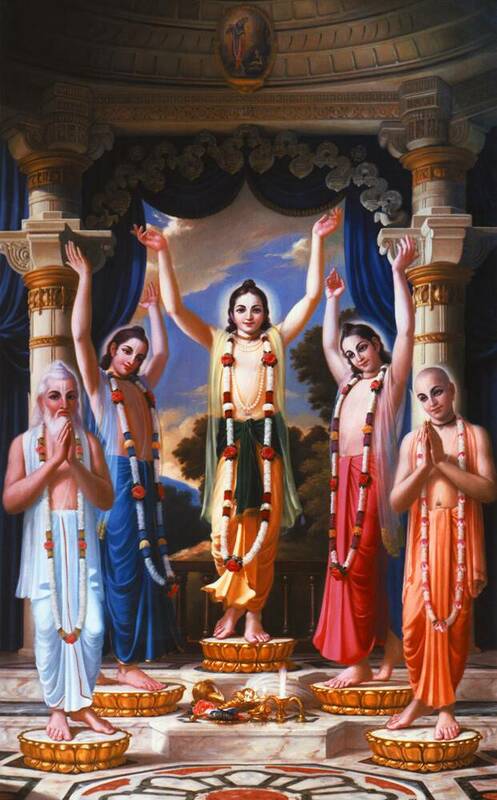 Devotees understand that Lord Nityananda is Balarama Himself — the first expansion of Krishna.